A beauty is resting after a bath, wearing a light Yukata. 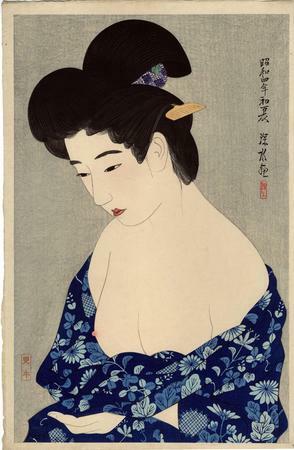 In the first famous exhibition of the then contemporary Japanese prints in the Toledo Museum of Art this print was labelled as After the Bath (Yokugo). The accompanying catalogue notes that there was an edition of 200 impressions. There is another copy of this print in the Museum of Modern Art, Tokyo. 1) In color in Fresh Impressions: Early Modern Japanese Prints, 24, p. 96. 2) In a small black and white reproduction in Modern Japanese Prints, Toledo Museum of Art, #22. 3) In color in 伊東深水全木版画 (All the Woodblock Prints of Itō Shinsui, Machida City Museum of Graphic Arts, 1992, #50, pp. 79. 4) In a small black and white reproduction in The Japanese Print Since 1900: Old Dreams and New Visions by Lawrence Smith, p. 58.